In “Naked Conversations” Shel Israel and Robert Scoble outlined how social media (then blogs) would change the way business “talked with customers.” In “Age of Context”, Israel and Scoble wrote about mobil, sensors and data and how they were changing business and our lives. 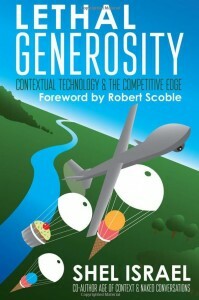 This time, in Lethal Generosity, Shel Israel, as always, breaks further ground drawing on “Age of Context” technologies to look more closely at how these technologies challenge and change the customer-business relationship. It’s all about Customers First: As he notes – it is not about whether the new upstarts or traditional companies win, it is about the competition that will put the customer first and the speed at which that is happening. In Lethal Generosity, Israel outlines how technology can now be used to better understand customers and how it can be put to work “to give people what they want as they shop, dine, or enjoy entertainment” – or even as they just go about living their lives. But why “Lethal Generosity” versus, say, customer-focused or centric? The quick explanation is that if your business uses technology generously for your customers and your relationship with them, that can be lethal to your competition (OR VICE VERSA). In a nutshell, Shel explains that best in the intro before he proves it throughout the book. A Book full of Examples of Technology and Technology at Work: Examples abound in this new book as well as an understanding the technology that underpins the possible today and the probable tomorrow. Examples include: cyber money and virtual currencies; the various beacon technologies, the coming of LTE-D, what underpins the growing contactless payments industry and more. These technologies are removing time taken to order and pay in restaurants, stand in line at a checkout or the time it takes to pay for transportation or a coffee. He outlines how the use of beacons can simplify shopping experiences; automatically deliver outfits a shopper sees on the store mannequin or find your favorite colors. But combining those technologies (and others) with the Web, Israel also tells us about companies listening to customers’ online conversations to deliver a better in-store experiences; companies that are delivering new and effective omnichannel experiences; and companies who are using the Web and software platforms to upset traditional business models. From location aware to contactless payments to Web e-commerce and more to come, Israel’s insight and storytelling make for a great read about today and what the foreseeable future can be like. But for Business Leaders there is More: this book goes beyond examples, the technologies and wonderful storytelling. This is a book about how in this contextual age, the customer experience is/has eclipsed brand trust. It is a story about businesses that recognize by using technology and social networks they can harness peer influence over brand message – and that saves money by minimizing marketing while maximizing efforts to build loyal customers and effective online communities. For some lethally generous social entrepreneurs their businesses are based on doing good while also making profits. These companies use generosity and causes to reach everyday people with everyday products as opposed to technology-based mobile apps or contextual devices. The contributions are marketing programs, not what traditional companies have treated as “goodwill sidebars”. Generosity and cause marketing is a strategy that he believes all sorts of enterprises will need to embrace over the short-term future. Corporate culture is one of those elements that too many business observers underrate or ignore. Many business cultures put profits before customers. Marketing and Communicators Take Note: As the book nears the conclusion, Lethal Generosity goes a step beyond what is lethal and generous in terms of products or services and business in general. Israel takes us on a bit more of a deep dive on marketing and communications. He zeros in on the opportunity of technology to scale personalization and nurture relationships rather than simply push outbound messages. In this regard, he points to how the mining and integration of data across and within the communications and marketing functions becomes key.